Hello, there health coaches. How are you doing? Would you guys like to learn some of the most powerful questions that you can ask your clients? Yes, this is going to be super useful today, so what we’re talking about, and we’re doing it because I know this comes up a lot where we feel uncomfortable in our client sessions. For those of you who don’t know me, my name is Michelle Pfennighaus. I’m a certified health coach with my own private practice as well as a mentor for my fellow health coaches and have been doing this for about 10 years now. If you’re watching as we are live streaming, go ahead, give a thumbs up and if you sometimes feel like you don’t know what to say, you don’t know what to ask during your client coaching sessions. Go ahead and tell me about it in the chat area and any other questions that you have for me today. While you do that, I just want to let you know that today’s episode is brought to you by my free training for health coaches. It’s called how to double your mailing list in the next 90 days. You’re going to. Learn some of the exact ways that I actually grew my own mailing list from zero to many thousands and you can sign up for that at findyourbalancehealth.com/double. Okay, so our main question for today and the first one we’re going to answer came from Irina and she said, I’m new to the group. I’m an IIN student. What could be the first three questions to ask my first client? I feel you baby. You’re in that mode where you’re like, I haven’t had any clients yet. 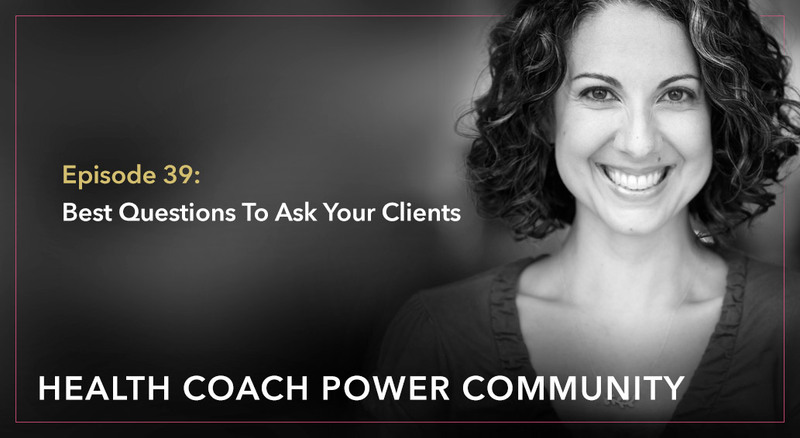 I’m scared out of my mind as to what I’m even going to say when I get in the room with one and this is really good preparation and I’m glad you asked the question because I actually had to think for myself, what do I ask my clients? Sometimes the conversations just rolls so naturally I hadn’t thought about it in a while, so thanks for a great question and I realized that the first question I usually ask any client, now we’re talking about someone who has already paid already signed up. They are my client. That means that we’ve already done a full intake or full health history already. I’m not asking them those types of questions, but in session number one, I always ask, what was it like for you to complete your food diary? Let’s talk about that. I actually always have my clients complete a food diary prior to our first session and it’s nothing intense. It’s like a three to five day food diary and I just need approximate amounts in there. I’m not asking them to measure and count calories or anything super specific, but I find it is the most useful tool to get started with. First of all, it gives us something to talk about and second of all, it allows me to really understand not only what they’re eating but their schedule and their whole life. So if I can see that, like every day they’re eating breakfast in the car, um, or every day they’re eating dinner at 11:00 at night, you know, it’s just really helpful for me to understand the whole picture of what’s going on with them. So that is usually the first question, not. Did you complete the food diary or any other. Yes, no type question, but what was it like for you to complete your food diary? And it sounds like a pretty basic question, but what’s interesting about it is that some people have a long and sorted history of dieting and food journaling and all kinds of obsessing about food. So this question will reveal some of that for you. My client will either tell me it was no big deal or she’ll tell me, oh, I hate doing food journals, or she’ll say, this reminds me of when I was doing weight watchers or whatever. So it’s good to just get that out there and understand where she’s coming from. I’ve also had clients who are just so busy, they’re not really committed to the process and I can tell right off the bat because their food diary, they barely wrote any details down. I asked them what it was like and they’re like, I don’t know, I don’t remember. No, they really weren’t putting that much effort into it. It’s a very revealing question just to ask them what the process was like. Okay. So that’s the first question that I always ask. The second question, you know, we’ll kind of do a little read through of the food diary together and if I have any questions, any things not making sense, you know, we just kind of go over it together and then I will ask if you were your own health coach, what advice would you give yourself based on this food diary? So I know a lot of coaches are worried about giving nutrition advice depending especially on what state you live in and is it a red state or is it an orange state and what can you get in trouble for? And I want to let you know that it is entirely possible to go through an entire coaching program with someone never giving a single piece of advice to the client. Coaching is really not about that. Sometimes I do give advice, but often what you’re trying to do is get your client to think for themselves. It’s very much teach a man to fish. Teach a woman to fish. So the question, what advice would you give yourself? Suddenly puts them in the expert role, which they are, right? They are the expert in their own bodies, not you, not anybody else. And empowers them to critically look at what they have written down that they ate for three to five days and make some assessments and judgments of their own. This is where we want to be with our clients. We don’t want to be in the role of I’m going to tell you what to eat. Okay? So usually my clients will look at their three to five days and they’ll say something like, well, not a lot of vegetables on here. And I’ll say, yeah, I noticed that too. Okay. Okay. So what would you tell yourself then if you were your own health coach? Well, I’d probably tell myself to. It’s more vegetables. I go, hmm. Interesting. So it’s a much more a conversation, right? It’s not like me up here giving instructions to the client down here. A lot of my clients will also say things like, I skipped breakfast or I often don’t eat enough at lunchtime or you know, they’ll notice other patterns throughout their day, so let them do that. It’s so useful. It is way more useful than me saying, Hey, I noticed you skip breakfast because that puts them almost like in a, Oh I did something wrong or I’m not good at this or I’m failing. But when they say it, very empowering. Okay. So those are my first two arena. Ask them how the food diary went and then ask them to give themselves advice after we’ve sort of moved through the food piece. Usually a food diary like there’s going to be so much to get into, but what they come up with will be the basics and it’s always the best place to start with whatever they want to focus on. So if they said, I want to add more vegetables, you know, or I should add more vegetables, I would say to them. Okay, so I heard you say that your advice to yourself is to eat more vegetables. How many servings of vegetables do you want to shoot for over the coming weeks or what’s one vegetable that you want to add or try over the next two weeks? So try to pin them down on something specific, like turn it into an action item. Not that I’m prescribing it, they said it, I’m just helping them get more specific about the action. So they’ll say, oh, well, um, I’d like to try something I’ve never eaten before. And I say, okay, well what kind of vegetable in. We’ll kind of go back and forth and decide that they’re going to try Zucchini. You know, they’ve never had Zucchini or whatever. They’re going to cook it for the first time. And that becomes an action item. So, I’m just kind of taking notes over here, writing down what we’ve agreed the action items would be and after we’ve kind of worked through that stuff, I feel it’s important to always address some sort of primary food issue or some sort of non-food topic during every session because truly what person is just the food that they eat. I mean none of us, right? We all have tons of other things going on in our life. So your first session, you don’t know this person very well, so you can pick up the conversation from last time. You can’t say, oh, so what about that thing that’s going on at work? How’s that going? You won’t know what to say. So what I will usually say is something like, what else is going on in your life right now that’s important for us to talk about today? And again, this puts them into like a critical thinking mind or they have to decide how they want to use this time with their health coach, what areas they want to explore, what’s important for them. I mean, all that stuff is super useful and then they haven’t even answered the question yet, but they will let you know. They’ll say something really stressful is going on at home, or someone in my life is sick or something at my job has been a real problem. I’m going to be traveling. Right? And so you can take it from there. Oh, you’re going to be traveling. How does that impact your schedule? How does that impact what you eat and how you exercise, you know, for the next couple of weeks. So all these things are conversation starters, openers, go ahead and give a thumbs up. If any of those suggestions so far have been useful for you. Or if these are things you’re already asking your clients, I would love to know. So there’s other really great questions that you can ask your clients. And once I started thinking about this question, I started thinking of all my favorite questions to ask my clients. Um, the really important thing though that I want to stress is that we are listening. We’re listening so much more than we’re talking and so much more than we are asking questions. I remember when I first started coaching, I would be like half listening to what the person was saying and half thinking to myself or writing down like, oh, what am I going to say next? What am I going to say next? And that’s not the way to do it. It’s okay to have a gap in the conversation to have a pause to say something like, okay, let me think about what I want to ask you next. That’s better than to not be listening and like planning. The next thing you’re going to say. So just slow things down and as your client talks about their food and their relationships and their job, one very powerful prompt. It’s not really a question, but it’s a prompt that you can give is that you just say, tell me more about that. Easy. Right? Go ahead. Try it with me. Tell me more about that. Really easy. You can use it just about anytime and you don’t want to overuse it. It’d be a little weird if after every sentence your client said you said, tell me more about that. They would think you were a little batty, but you want to listen for, I’m going to call it the fault lines. You know, like a fault line where an earthquake happens. You want to listen for the fault lines in what your client is telling you about the stories that they’re telling you, whatever they’re recounting for you. Where does their voice waiver or what is that thing they keep kind of mentioning like half mentioning in the background? Yeah. You want to listen like almost to what are they not saying? What needs to be said here? And those are the areas where I will pause or I’ll wait for them to stop. And then I will say, you know, you’ve mentioned your sister a couple of times. Tell me more about that. Or um, so you’ve mentioned you’ve been a lot on a lot of diets in the past. Tell me more about those. Okay. So you want to listen for like where there’s more story that may really fill in some juicy bits of the conversation. So you can get to know them better, but also so you can understand where they’re coming from and also maybe really what they need to work on. Maybe they don’t really need to work on eating more vegetables. I mean that’s good. Don’t get me wrong. Everybody should eat more vegetables, myself included, but maybe they really need to talk about what’s going on with their sister. Okay. So this is your opportunity to prompt them. Tell me more about that. We can all say that, right? That’s an easy one. The next two I’m going to share with you are a little bit harder to slip into common conversation, but don’t worry. I will tell you how I do it so that I don’t feel super awkward about it because these are really powerful questions. Okay. The next question is one that I use for clients that are like kind of stiff. They’re the ones who just really want me to tell them what to eat and the very serious and they’re not giving away any extra information. I want the extra information, I want to get it. The juicy bits. I want to know what makes them tick. Actually, I want them to know what makes them tick because why bother improving your health? Why bother eating healthfully if you’re not living for something, and honestly guys, that is the bigger issue for most of our clients. I’m just going to put it out there. So one thing I will ask is this question, what would you do if you knew you could not fail? Now, like I said, that was a little awkward. You’re just like slip into the conversation all of a sudden. So what I’ll usually do is I’ll wait for some sort of pause. The conversation kind of goes into a wall and then I’ll say, you know what? I’m going to ask you a kind of strange question and I want you to answer it even if it feels a little weird and they’re like, okay, but now I gave him a little heads up that we’re going to depart from the type of conversation we’ve been having up until this point. We’re going to do something a little different and they treat it maybe more like a little game. We’re a little exercise, which is exactly what it is, so I’ll say, what would you do if you knew you could not fail? This is going to stump so many of your clients. It’s just going to go silent. Like if you’re on the phone, you’re going to be like, hello? Hello? You still there? [inaudible], they’re going to go, “I have no idea how to answer this question.” Not all your clients, but lot of them. A lot of them are going to say, I don’t know, and your job is to not accept. I don’t know. Your job is to say, I know you don’t know, but if you couldn’t fail, what do you think you might do? I just keep reworking the question into something that is comfortable enough for them to actually answer because most people have not thought like this. They’re thinking about the bill that has to get paid. The 14 errands they have to run today. The thing we got to get in the mail and the thing that’s going wrong at work. They’re thinking like this big and we’re asking them to think this big and find again, kind of find their why, find their reason for their motivation to do any of this work with you. What would you do if you knew you could not fail? So I’ll tell you a story about one of my clients, she, she was exactly what I just described. She was all wrapped up in like what I have to do today, what I didn’t do, you know, yesterday that I need to do today because I didn’t do it yesterday. And just like in the, in the weeds you would really say. And I asked her this question and she was like, oh. So we kept going and kept going. She was a nurse. She worked in geriatric care. She just could not answer this question. And it turned out that her parents, the, you know, the voices that her parents had put in her head, were repeating themselves. Like at every time she thought about something she wants to do in her life. Like she told me, even when she was going to go up to college or when she was going to go to nursing school or whatever she was going to do in her life, her parents were always like, really? Do you think you really should do that? That doesn’t seem like a very good idea. And so she was carrying that around with her and it was nearly impossible for her to figure out what she would do in this life. That awful scary. I have no clue what you would do in this life. You only get one of them. Anyway. It was amazing. Took us a few sessions actually to get an answer, but when we realized what her answer was with her big calling was in life. I mean big stuff, you guys. And I mean she ended up quitting her job that was keeping her small and keeping her in the weeds. And um, she got a new job that was much more in line with what she wanted to accomplish. And I mean, I, I know that had everything to do with this question so we can affect big, big, important changes in our clients when we ask the right questions. I’m going to give you one more. This is a question I usually use toward the end of somebody’s coaching package. Like if we’ve been together for three months and it’s coming to a close there six months and it’s coming to a close maybe on the last session, maybe the second to last question, and this one takes some, a little preface as well. I’ll say again, know I’m going to ask you something that might feel a little strange. I just want you to answer to the best of your ability. Okay? And I’ll say, close your eyes and you guys can do this now too. If you want, go ahead and close your eyes and imagine yourself five years from now they’re like, okay. Then ask them, how old will you be? That’s an easy answer. There’ll be able to do the math. Where will you be? What are you visioning right now? I’ll say, where are you? What are you wearing? Who are you with? What are you doing? How are you feeling? What else? You know? Tell me everything about this vision that you have for yourself five years from now, five years. Most people can manage, they’ll give you a picture. It’s you. Sometimes it’s a lot different. Sometimes it’s not that different from where they are that day, but most people can manage that and then you say, okay, great. Now again, I want you to imagine yourself 10 years from now, right? It’s you up the ante on them. Same thing. Have them describe what they are visioning in their heads. So just like the last question, a lot of people are going to be like, I don’t know, nothing. I can’t. I have no idea. And then you have to work around that. Yeah, I’ll tell my clients, I’m not asking you to set goals. We’re not going to make a plan for how to get there. You don’t have to worry about actually ever getting to this place. I just want you to tell me what you see or what you imagine. It’s fiction. Let’s have some fun with it. I had a client who, again, could not answer this question, she was very stuck in her life, very stuck in so many different ways and we finally, she was a teacher. No kids had been living in the same place doing the same thing for like 20 years. No Change, no change for health, not changing, very resistant to change and we did this exercise and we came up with this idea that she really wanted to be writing fiction for children, right? Like she wanted to write the next Harry Potter series like that became her, her dream for herself or her vision for herself. How powerful is that? Up until that day it was like, I don’t know. I don’t know. I’ll just keep teaching. I’ll just keep doing what I’m doing. I’ll just stay sick and overweight the way that I am because I can’t bring myself to change. No motivation, no bigger picture. And then if there, if you’ve got this far, you can do it again up the ante and ask them where there’ll be and what they’ll be doing and what they envisioned for themselves in 20 years here. So those are some really powerful questions that you guys can incorporate into your coaching and there are so many more, but the goal is always to ask big, open ended questions, not the yes or no type questions. Alright, we’re going to move on. But if you have any questions that you love to ask your clients, go ahead and put them in the comment area and we can sort of brain share that way. Here’s another question. Comes from April and April said, I was curious to know what the typical protocol is when it comes to client files. Are there any specifics that need to be aware of when I keep a client chart? So, April, I was assuming that you were asking about what sort of information goes in a client chart, like what exactly are we charting? So, um, uh, again I just thought to myself, well gee, what do I keep in a client chart? And I went and looked. So the first thing that you guys want to have in your client charts is their contact information. You know, make sure you have their address, their phone number, their email address, you know, sometimes you’re only communicating with someone via email and maybe you’re calling them or they’re calling you from like their work number, make sure you have their cell phone number, things like that. And it’s nice to have their home address because sometimes we’ll want to send a holiday gift or something like that, you know, just want to have all the basics on file. The other thing would be their health history, their completed health history form or intake form. So everything about their, their whole life, their whole health history, you have it right there so you can refer back to it anytime you need to. After that you have your session notes. So for each session I usually scribbled down notes on a pad of paper while I’m talking because I find it to be just the way my brain and my hand works. They want to work together in that way. I don’t like typing while I’m talking to someone. So that’s how I do it. And the other thing that you want to keep track of is the original package that the client purchased from you as in how many sessions? Like what is, what package was it, was it like eight one hour sessions? Is it a six month package with 12 sessions, you know, have those specifics written down somewhere and the price that they paid you, it seems kind of obvious. But the truth is that within like a six month period, it’s likely, especially if you’re just starting out that you will change your packages. So this has happened to me where I, I finished with a client and they want to sign again, but I have since changed everything about how I’m selling my packages and I’m like Oh my God, I don’t even remember what they originally paid for and how awkward for them if I gave them like a totally different price and a totally different package. So I always try to grandfather people in whatever they bought before, you know, we can stay at that rate or we stay at that structure. So it’s not disruptive for them. But any new clients, I might offer a new package or new pricing, so those are all the things that I keep handy for every client and this would be a really good time to also just tell you April about practice better. If you guys aren’t familiar, you probably are going to talk about it all the time, but practice better is a service. It’s not very expensive and it helps you keep track of all of these things. Basically your client file online in one place. Your client can access the notes, you can access the notes. Everything’s there forever and it’s just been a real godsend in my practice so that I’m not using a paper file like I used to. Anyway, great question. Thanks for asking. Okay. I have another one here. This is from Melissa and Melissa says, I’m a health coach and IIN Grad and I’m struggling to get clients coming and spending the money to hire me isn’t happening. I’m going through a dry spell first time in two years that I have no clients. I would love ideas or resources around creating an online virtual program like platforms, hosts, etc. to look into. So, Melissa, my question to you is what is your mailing list look like? Because I see two different things going on here, but I think you’re saying is nobody wants to commit and spend the money to hire me. So instead I’m thinking about creating a virtual program which would be less expensive and maybe they’ll sign up for that. Well, let’s take a step back because if for two years you’ve had clients, that means that for two years people have been willing to commit and to spend the money. What happened in the past couple of months? You know, did the economy totally tank? Did something else really severe happen? I mean, to me, whatever you’re selling at whatever price point is just as valid today as it was last year and people were buying last year. So what’s changed and what. I don’t know everything about your business. So I’m making some guesses right now, but what usually happens with coaches when we start out is that we have our network, we have our friends, we have a family, we have our acquaintances and we get clients and then maybe we get some more clients and we think, oh boy, this is pretty easy. This isn’t everybody’s experience. But for coaches who have a steady stream of clients in the beginning, sometimes it can start to feel like, what’s the big deal? I got clients, I’ve got clients, and then all of a sudden, boom, it dries up and usually that means that you haven’t been nurturing and building an email list because if your initial audience, let’s say you had initial reach of about 200 people and you’ve got a bunch of clients from that 200 people, but now they’re all done and no one else in that group wants to be a client. That would be a reason why you’re having a dry spell. Not because what you’re doing is wrong or what you’re offering is wrong or the pricing is wrong, but you just aren’t reaching enough people. You’re not reaching a new group, so if you had been nurturing and growing a list for the past two years now maybe your list would be a thousand people and there’d be a whole new pool of potential clients for you to work with. And so I think, Melissa, if I were you, I would start thinking really, really strongly about your marketing. It sounds to me like a marketing problem. It doesn’t sound like there’s a problem with your product itself. So again, let me remind you about my free training just because it just makes so much sense right here. Um, you can go to find your balance health.com/double and sign up for my free training. How to double your mailing list in the next 90 days. I think you will get a lot out of that, Melissa. And at the same time, if you do decide to go ahead and create an online program, well you’re going to need a list to sell to then too. So it was big of a list as great of a, you know, perfect. A list full of your perfect prospective clients is really what you want for whatever you’re selling, so it’s going to serve you either way. Alrighty you guys, thank you so much for asking great questions. I think getting a ton of feedback about how much you love this show. Many of you were saying that you join us every week either listening via podcast or you’re watching online, so just be sure to subscribe so that you don’t miss an episode. We do a new topic every week and you’ve been. You’ve been actually getting a lot of value from the show and I know a lot of you have been and all the free content that I put out there. Please leave a written review on iTunes. That’s what I need in order to be able to reach more coaches and keep doing this work. Thank you so very much for being here. Have a great week and I’ll see you soon.